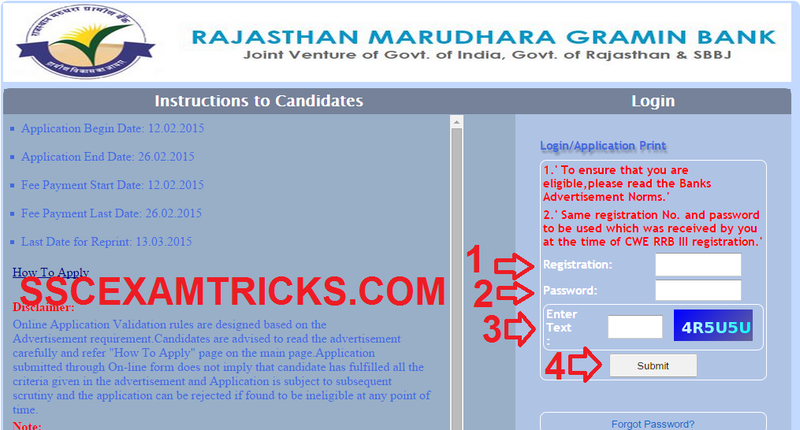 Rajasthan Marudhara Gramin Bank (RMGB) had released notification advertised against for recruitment of 508 posts of Officer in Middle Management Grade (Scale III), Officer in Middle Management Grade (Scale II), Officer in Junior Management (Scale I) Cadre and Office Assistant (Multipurpose) on the basis of performance of IBPS CWE III held in the month of September/October 2014. The online applications are invited for these vacant posts have started from 12th February 2015 and end to 26th February 2015. A huge number of candidates had qualified in IBPS RRB CWE III written examination. The candidates will be called for interview based on the post wise and category wise cut off marks which will be released by RMGB on the official website. The final selection will be made merit based on the performance in written examination (IBPS RRB CWE III) score and marks obtained by the candidate in interview conducted by Selection Committee of RMGB. Interested candidates will be applied online mode only. No application other online mode will be accepted and liable to be rejected. Candidates are advised to read the GUIDELINES before filling ONLINE application form. Go to Apply Online for Registration direct Link provided below. Click on the direct link say Apply ONLINE for Stenographer Posts. Fill ONLINE Application form (don’t leave RED star mark columns). Mobile No. is mandatory Column to be filled by the candidate on which password will be sent by Organization. Click on submit button for Registration of Step I. Select the payment Bank for Payment of Application Fee. Select the Mode of Payment ONLINE or E-Challan. Attach Scanned colored photo and signature as asked in prescribed size. Enter the other required field mentioned on screen. Click on submit & lock button. It will process your application form for final submission. If it goes all correct it will show you a massage of Submitted Successfully. Save and Print the application form. - Rs. 20/- for SC/ST/PWD candidates. - Rs. 20/- for SC/ST/PWD/EXSM candidates. A cut off will be released based on the performance in IBPS RRB CWE III which was held in the month of September/ October 2014. The cut off will be released category wise i.e. General cut off marks, OBC cut off marks, SC cut off Marks, ST cut off Marks. Then Interview call letter will be released to short listed candidates for interview. Three times more candidates will be called for interview of the posts. The selection will be based purely on Merit list which will be obtained after interview of all candidates. The total marks of Interview will be 30. The minimum marks to qualify interview will be 12 marks. Total weighted score / Final Merit lists will be calculated on the basis of performance in CWE and Interview. The interview will be held at the GUNTUR center. The exact venue of interview will be intimated on the interview letter which will be released shortly. The interview letter will be intimated on the official website at least one week before the commencement of interview. · Print Interview Call Letter on a neat & Clean A4 Size white page. · Paste the passport size photograph on the box (mentioned in the interview letter) on the prescribed size. · Note down the Interview Date, Time & Venue mentioned. · Read the instruction carefully mentioned in the end of the interview letter. · Mark-sheets & certificates for Graduation or equivalent qualification etc.